The Commander 24' Dry Slide is certain to impress at your next big event or party, and keep them climbing for more! Participants can enter the slide on the left and climb the impressive 23 plus feet, and enjoy the fast and furious ride down the right side to the well-cushioned bottom. With a right-side exit, players are free to run around to the entrance and ride over and over. The Commander's colorful red, purple, green and yellow theme is sure to be eye-catching, drawing attendees in to check out the fun. The Commander 23-foot, 6-inch dry slide is a great way to promote fun and healthy activity, and will add value to any indoor or outdoor event! The slide is made safe and secure with lite n strong , fire-resistant vinyl making it safer, portable and more durable. ** Rental price includes local (within 15 miles) delivery, set up (on grass), teardown, and pickup. Additional delivery/pickup fee for outside the 15 mile radius. **Includes 4 sliding mats, 1 blower, and 4 stakes. 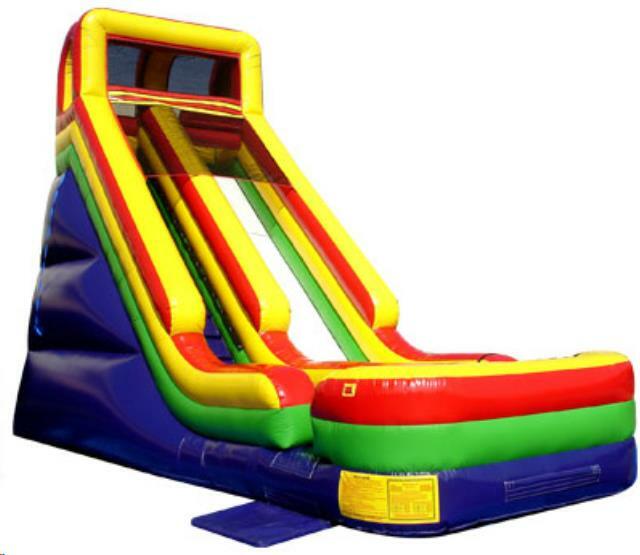 * Please call us for any questions on our 24 foot commander dry slide rentals in Rocky Mount and Wilson NC.